Well now that Fuzz is finally OK with the stairs, my Mom can work out of her new home office. This office has a couch, which is very cool. I assume she got it for me since I am her Vice-President. I interviewed Fuzz the other day and have decided to hire him to start as my assistant. He wanted to know what he gets paid. 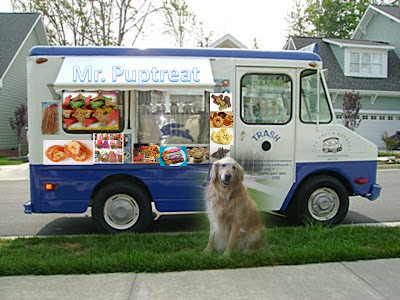 Well, I get paid in tennis balls but I know he will expect cookies. I need to consult with my boss (Mom) about this. Mom was so excited I was in her office this week, that she placed a big basket of toys next to me. Obviously, the toys were very appealing. There are so many of them, I didn't know which one to play with first. But I will enjoy each of them I am sure. And then she put a pillow next to me with my name on it and a dog that I guess is supposed to be me. It was on the couch when I first came in. Now what am I supposed to do with it? Bear explained that these are just weird things Mom does. He said don't try to figure her out. I think he heard that from my Dad. For my Dad's birthday, Fuzz and I got him the coolest presents. Board shorts with our pictures on them! 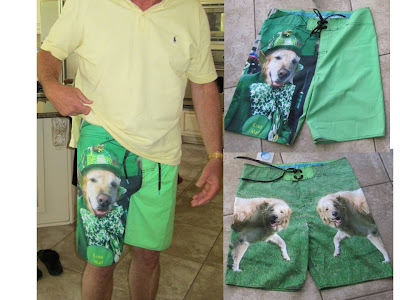 (Dad calls them swim trunks). I made mine with my Irish Bear picture since he is Irish. Fuzz made his with Dad's favorite picture, the happy dance. One pic on each side. Well last weekend, Dad finally wore them! I thought for sure he would wear Fuzz's first since he's his favorite. But he wore mine first! and then he wore them again! He hasn't worn Fuzz's yet. Fuzz says he is saving the best for last. I think he just likes mine better. Well, whatever. I like being first for a change with Dad. We sometimes pass this empty lot on our walk. Mom and Dad like to throw Fuzz and me sticks so that we can run around and play fetch. Fuzz and I discussed this and decided we would rather chew the sticks. So the first time they throw them, we fetch and retreive. Mom and Dad get very happy. The next time they throw the sticks we get them and then sit down and chew them. Fuzz and I get very happy. I think that is fair. Mom and Dad had spaghetti and meat sauce for dinner yesterday. I was so excited because I know there are always leftovers for me and Fuzz. And I was right. After the table was cleared, Mom took our bowls and put spaghetti in them. Total YUM! So it got me to thinking. I have already declared Taco Tuesday (although my Mom does not always respect my declaration.) Well now I declare that every Sunday should be Spaghetti Sunday. Fuzz agrees. Yesterday we heard this silly music on our street. My mom turned around and said, "look its an ice cream truck!" That peeked my interest. She told me when she was a kid these trucks would come around and sell ice cream. So it got me to thinking. 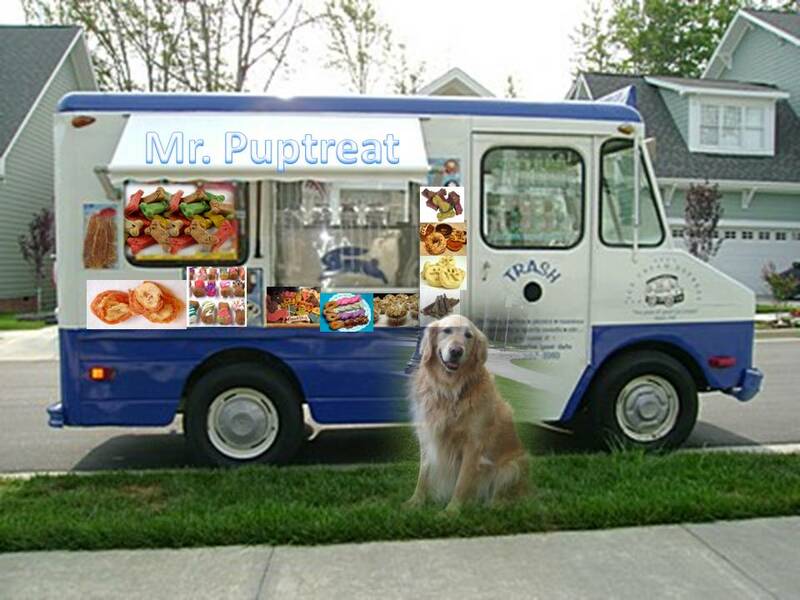 Why not a Treat truck for Dogs? A lot easier than ice cream, and treats have more variety. I wonder who would do this with me. Fuzz can't be a part of this, he would eat all the merchandise, hence profits. And besides he doesn't have any money and he can't drive. I need a human with a truck. We have this arbor thing in our yard and my mom started growing vines on it. Then the Crape Myrtle trees started blooming. It looked so pretty it reminded me of where people have wedding ceremonies. That got me to thinking. I could have my wedding ceremony there. Yah. I know. I am not even engaged. I actually don't even have a girlfriend. And I don't know if it is legal for two dogs to get married in this state. I somehow doubt it. Oh well. So much for Mr. and Mrs. Bear Bear. When we were at Shelby Farms Park I saw a horse. I immediately ran over to it. The woman on the horse wasnt so sure about me. My parents told her I was ok, but called me back over. The horse winked at me. I smiled. I love horses. In my foster home I had a horse friend. I really loved him. I wish I could have a horse in my forever home. Bear explained that it won't happen. But I think it is worth a try. My Dad loves me so much and seems like a softie with me especially since I am his favorite. So maybe I will ask my Dad if I can have a horse. Why is Bear rolling his eyes? We have this plant stuff at our house called Monkey grass that feels really cool to lay down in. And I think it is hard to see me since it is so tall. I laid down in it today and it got me to thinking . Mom has this picture in her office of a cheetah hiding in very tall grass. But the cheetah is the same color as the grass because it helps her to be camouflaged for protection. Hmm I thought. Grass is green, I am gold. Something's gotta give. I wonder if Mom will let me paint the grass the same color as me so I can be camouflaged. I somehow don't think so. Well, maybe I will just wear a green shirt. Last weekend we went to Shelby Farms Park Off-Leash dog park for the first time. I knew it was on 37 acres, but I pictured a normal dog park with fencing and lots of other dogs. But to my delight, it was just a wide open place with lots of trails and lakes. Off we went, off leash of course. 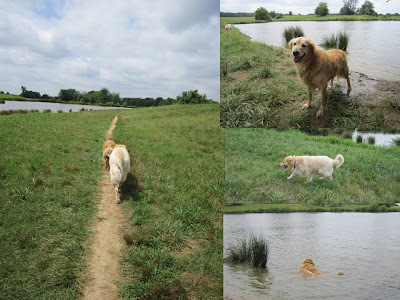 We walked down to a lake. I went in to cool off. How exciting. My first lake experience. We didn't stay too long at the park because it was hot. I don't know why everyone didn't come in the lake with me to cool off. Oh well. I hope we go again real soon. Mom came home the other day calling out my name sounding all excited. She had a big bag and said she found something that she can't wait to show me. I thought uh oh. If it was something like treats or toys, she would have called Fuzz too. And out it came. A Sponge Bob costume. And I knew what was next. 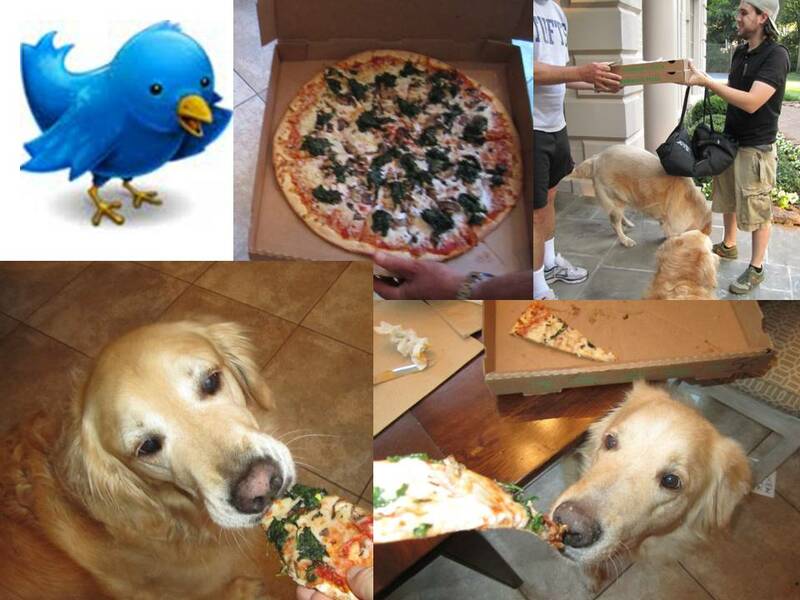 This is why everyone calls me such a good dog. I always humor my mom cause I know it makes her happy. So I put on the costume including the shoes and became Sponge Bear. The other day my parents went to a steakhouse for dinner. When they came back, Mom was carrying a little silver bag. I asked what was in it. Mom said it was a bone, but since there was only one, I couldn't have it until tomorrow so that Fuzzy could have one too. I was bummed, but I guess it was fair. So the next day they went to the supermarket to get a steak with a bone. Mom was planning on giving the whole steak to Fuzz and me, but Dad ate it! Bummer again. But then, he gave the bone to Fuzzy and brought out the little silver bag for me. There it was. My bone. Total yum. Now I hope all my presents come in little silver bags! 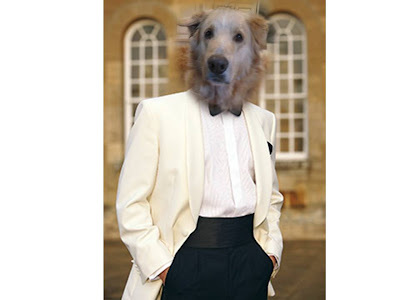 As Fuzz buzzed about in his post, yesterday was the red carpet and pre-pawty for the Anipal Awards. He dressed in a tux as you saw. I went a la Sean Penn in an all black very cool ensemble. Today is the big Awards PawPawty. Someone asked me if I was coming dressed up or in my golden fur. Well, I thought why not dress up but still be covered in gold. 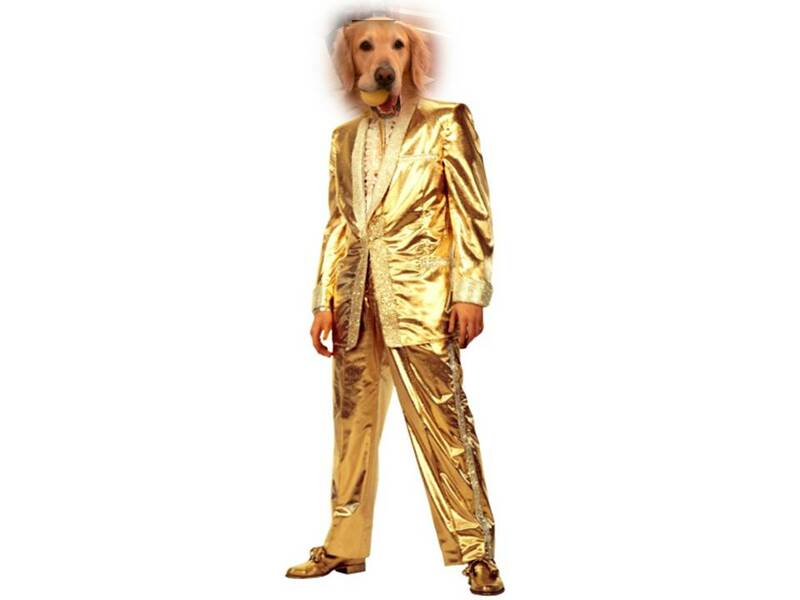 So for today's pawty I chose my Golden Tux. Can't wait for those bacon beers! 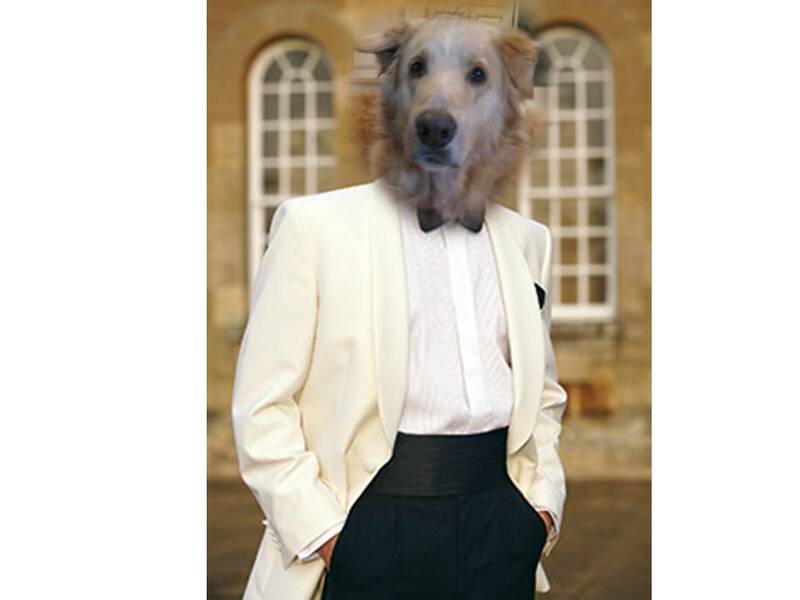 Sometimes my brother Bear gets dressed up for different twitter events. Tonight is the start of the Anipal Academy Awards weekend starting with the Red Carpet. So this time, I decided to go with Bear. I chose the white tuxedo since he was wearing a black one. My sis in fashion said I looked dapper. I was going for dashing. Uh Oh. I think Bear may be pissed since I got my event pic published before him. Oh well. Good luck to all the nominees! My Mom & Dad took the family to see the Peabody ducks last weekend, When they came home, Mom showed everybody these two quacking duck toys. I was so excited because I thought they were for Fuzz and me. But then she gave them to Caroline and Drew! I thought maybe there were more, but nothing else was inside the bag. Bummer! I tried to take one from Caroline but Mom got mad at me. So no ducks for me. But this morning Mom came downstairs with one of the ducks! She said Caroline must have left it here by mistake. But I know better. Caroline loves me and she left it for me as a going away present. Thanks Caroline! QUACK! I just heard about this thing called a heat index. 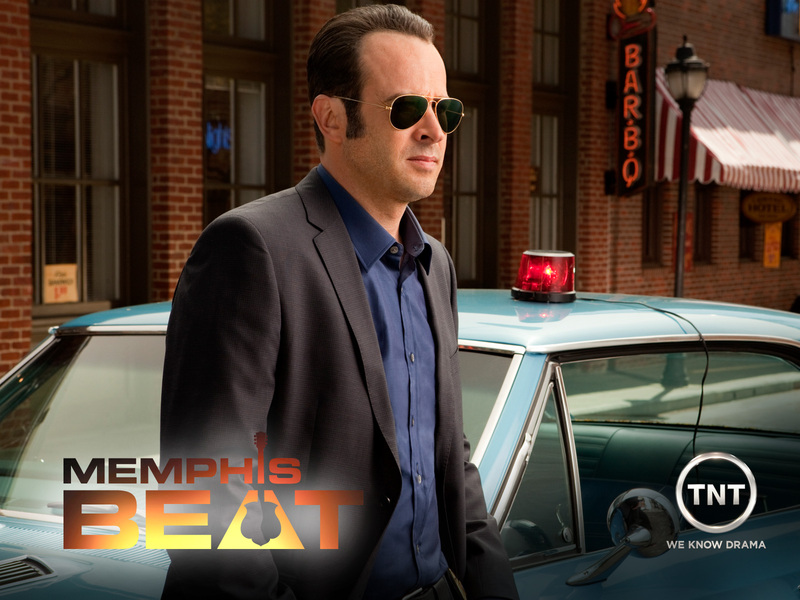 There is supposed to be 110 index here in Memphis today. So I will be staying inside. Which of course means that I will be taking more naps. So it got me to thinking. Is there also a nap index? How is it measured? Minutes per day? Does it include sleeping or just napping? I think it should be both. So if there are 1440 minutes in a day that is probably the top number of the index. So on a normal day I would say my index is about 720. I wonder what my nap index will be when it is 110 heat index? 50% higher? I really need to start keeping track of this correlation. I could be on to something. The other day Fuzz found my big bully stick and brought it to the side yard. He set it down and then walked away. So I immediately took it and started carrying it away. After all, it was mine. He ate his already. Well while I was walking away, Fuzz came over and tried to take it and eat it. But there was no way I was going to let that happen. I dug my feet solidly into place, held that stick and didn't move. He kept on chewing and trying to pull. But I stood my ground and held on. After what seemed like hours, Fuzz gave up and walked away. The humans all cheered and were so proud of me. The other day my family went to the Memphis zoo. As usual, I wasn't allowed to go. 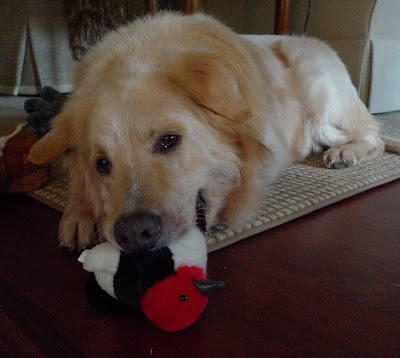 When they came back, my niece Caroline brought me and Fuzzy each a toy. Stuffed owls, one brown, one white. They are very cute and we liked them. But then Mom took something else out of the bag from the zoo. She asked Caroline if she wanted to wear it. Caroline said "no thank you.". I thought uh oh as Mom approached me. And that is when I became PandaBear Bear. This week, my little nephew Drew was here visiting. I thought I was obsessed with balls until I met him. But as you know, aside from tennis balls, another one of my very favorite things is rolling. Well Drew watched Fuzzy and I rolling everyday. 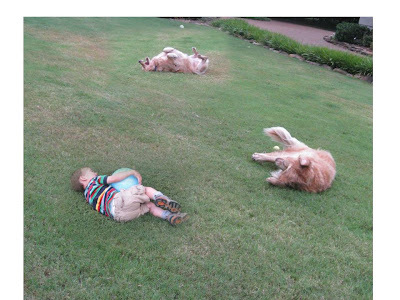 Then yesterday, Drew came over to the grass and rolled too! How cool is that! Fuzz and I taught a human a dog trick! And we didn't even need to give him a treat! Too bad Drew is leaving today. I wonder what else we could have trained him to do. During my family's visit this week we have been going in the pool everyday. It reminds me of a circus. Sometimes, Dad throws Caroline up and down in the air like a trapeze act without ropes. Then there is Drew in that little boat thing that he "drives" around like a clown in a crazy car. Chris jumps off the diving board and does a cannonball. Don't they have men coming out of canons at the circus? Bridget I guess is the ringleader since she is usually in the center cheering everyone on. I, of course am the animal act (but don't worry, no animal cruelty here. I am treated very well). And every circus needs an audience. And that is my Mom and (sometimes)Fuzzy. Cant' wait until tomorrow's circus! My niece Caroline is visiting this week. This is the first time I met her. She is really cute and really nice. I had a tummy ache, so she brought me a bunch of toys to help make me feel better. She says that she wants to be a veterinarian when she grows up. Well in the meantime, I think she makes a really good nurse for me. The toys did make me feel a little better. My sis Bridget and her family came to visit this week. She wanted to play tennis last night with her husband Chris. So I went to the court with them since they took my tennis balls. I got to play doubles with Bridget. How cool! Every time Chris hit the ball to her that she couldn't get, I would go get it and catch it. I don't know if they kept score, but I think we would have won the match. We made a great team. See, Wimbledon really did inspire me. I like to tweet, no, not like a bird, like a twitterer. Anyway, I was eagerly awaiting the day I would have 1000 followers. So the other day when I was getting close, Mom said we could have a pizza party when I hit 1000. So it happened and we had pizza! Now I have a new goal of 2000. I am thinking about what type of party I could have for that....hmmmm. Any thoughts? This past weekend my Aunt Kathy came to stay with us. I haven't seen her for a while, so I was very happy to spend time with her. Last time she visited, Oliver was still around and he was her favorite. This time, I wasn't gonna let that happen. So the first night, Fuzzy tried to win her over by immediately being all loving and licking her feet. But then the rest of the weekend, I just laid on the full Bear effect and I think it worked. I think I am her favorite now. Of course, she probably loves her granddogs Sierra, Riley and Alice best, but I think I am her favorite nephewdog. I love you Aunt Kathy! Sometimes when I was at the beach I would see humans laying still in the sun with their eyes closed. 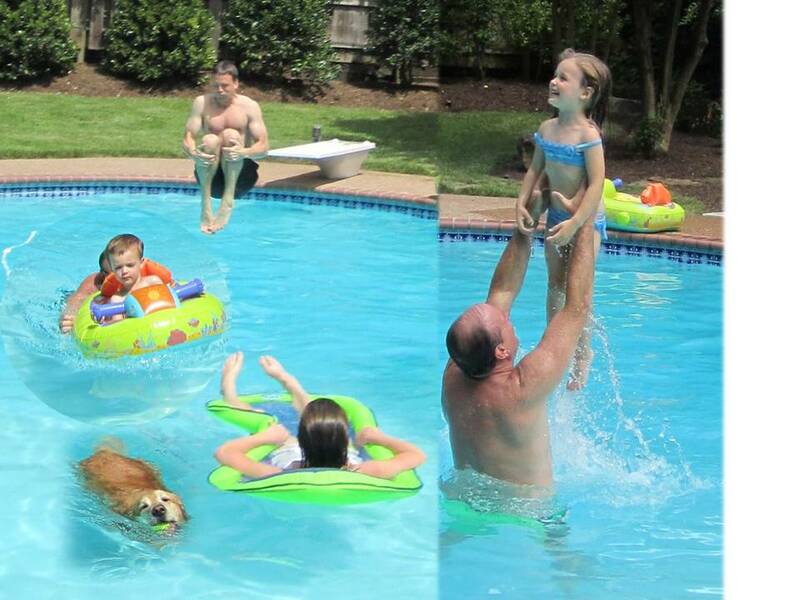 Now in Tennessee, my family and visitors come and do the same thing at my pool. So I asked Mom what all these people are doing. She said they are trying to get a sun tan. Oh, so they want to be golden like me? She said sort of. So I noticed that my belly was a bit white so I decided to try tanning. Not sure how long it takes to get more golden, but I was too hot to find out. Maybe I will borrow my sister Sydne's bronzer for my stomach fur instead. Today is Independence Day in the US when we celebrate the signing of the Declaration of Independence in 1776. And since it seems everyone always looks for a reason to party, these are one of those days. Actually, one of those weekends. So there are the usual holiday parades, concerts, picnics and barbecues. But this one comes with fireworks too. Those I am not thrilled about because the noise scares me. But what I want to know is why do these celebrations never call for Pizza? Anyway, Happy Fourth of July everyone! With all this excitement around Wimbledon, I thought I would I would try my paw at tennis. Since it involves tennis balls, I figured I would love the sport. Well, the racket is a bit hard to hold in my paw. So I asked Mom to play an alternate version of the game. She went to one side, hit it over the net where I was and I fetched it and brought it back. It is lots of fun. However, since it is hot out, I got hosed down before the next set! I thought I might try soccer again since it was fun when I first tried it last weekend. So I went outside and Mom kicked the ball. I started chasing it and then ran back to the door. It was WAY too hot. 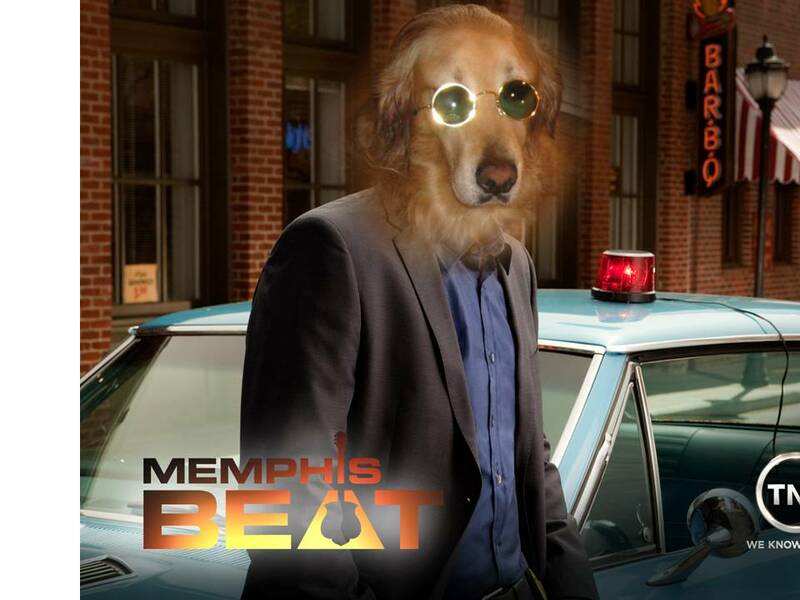 So I decided that if the Woof Cup is played in Memphis (or any other hot summer weather locale), it needs to be in the winter or indoors at all other times of year. In the meantime, I will personally wait until it gets cooler to see if I can join a team. There are so many birds around here. Well it is no wonder. Mom and Dad put up bird feeders and mom throws bird seed on the ground. I look at all the birds outside the window. And I love to chase them, but they always fly away. Yesterday, I found this bird in the toy basket. It even chirps. Not sure where it came from. Maybe Mom dropped some birdseed in the basket.